Remember - while we're done for the season, the Urbana Business Association's Holiday Market is just getting started. 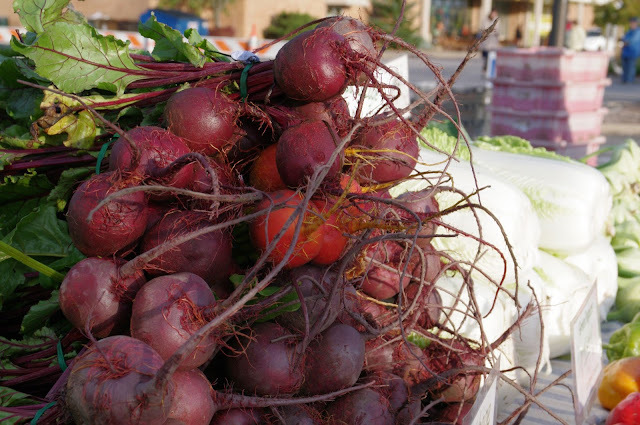 The two markets share lots of vendors, including fresh produce growers. 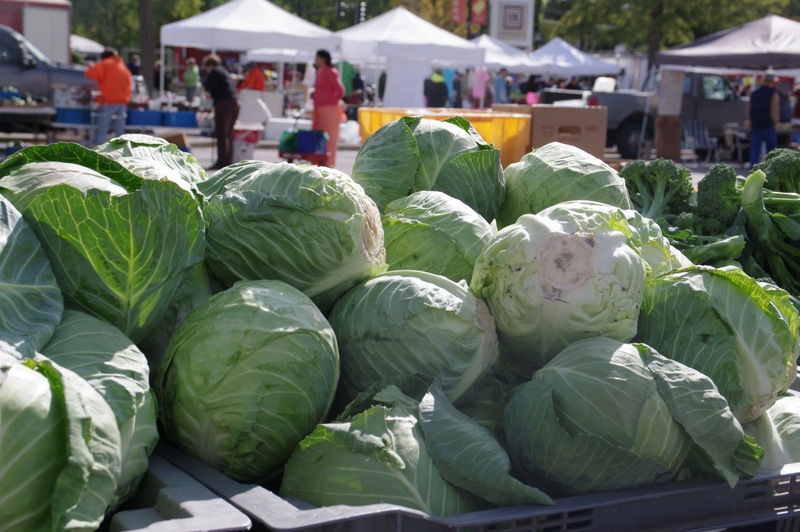 We heard Jeff Meyer of Meyer Produce tell someone he'll have Brussels sprouts for the duration of the Holiday Market - best get over there. YUM. 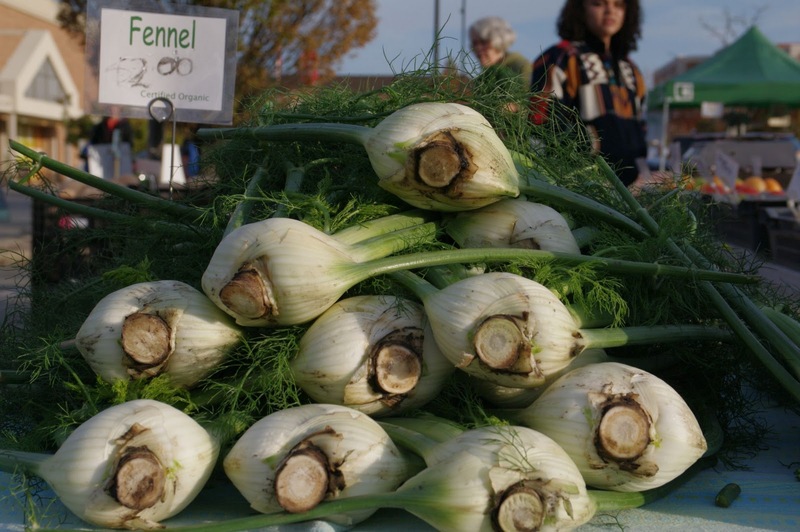 Urbana's farmers market is a vibrant market that connects the community with local food growers and producers, strenghtens our local food economy, provides access to local artisans, and serves as a community gathering place. We're now on Google Plus, if you're so inclined to follow us there. The Market starts 172 days from today. Trust that the planning has already started. More information about the Urbana Business Association's Holiday Market at Lincoln Square, which starts 11/12 at 8 AM and runs through 12/17 at 1 PM, is available here. You can follow them on Facebook, too! 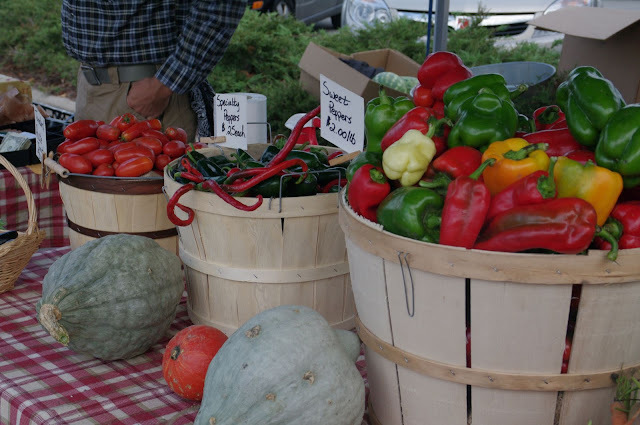 For those of you who are all about the outdoor farmers market experience in Urbana... it's coming to an end for the season after this Saturday's market. The weather forecast for this bittersweet day is auspicious - a chilly start in the 30s, but sunny and into the high 50s by the time we end the season at noon - and there will be food. Lots of food. 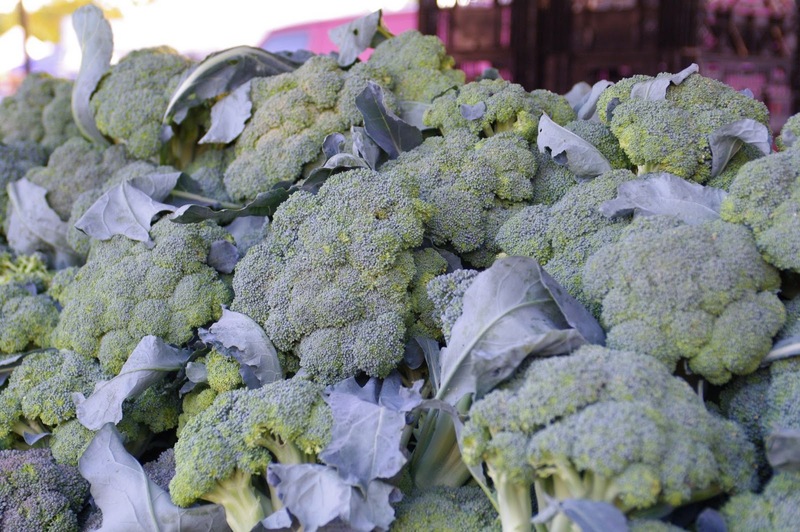 Not pictured: Some of the best carrots we've ever seen at the Market, huge piles of broccoli and cauliflower, some hanging-on-for-dear-life heirloom tomatoes, tons (literally?) 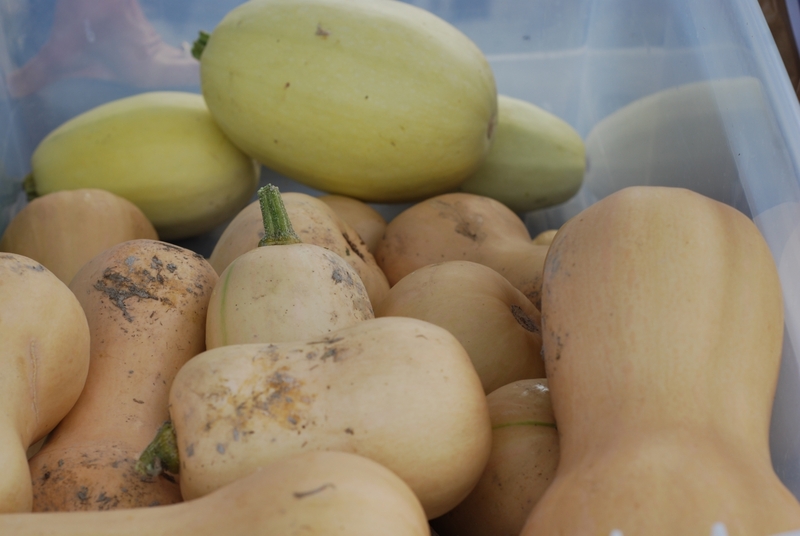 of squash, and more. We would be remiss if we didn't mention how gorgeous the greens are right now, too. They're amazing! While we won't have as many artisans at the Market as in weekends past, several of them are still out at the Market this weekend, hoping to help you get a head start on your holiday shopping. 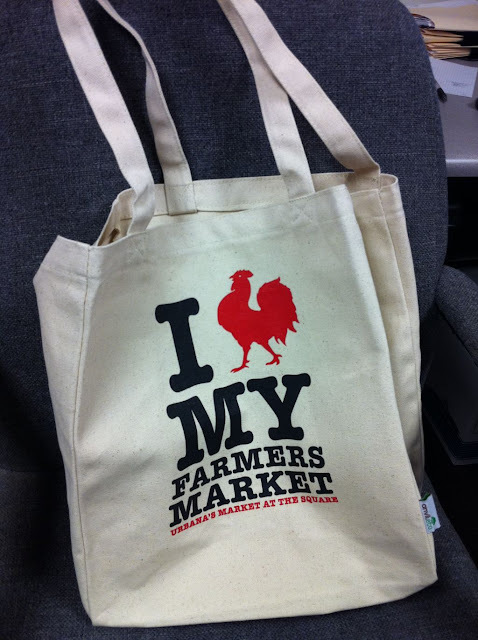 Speaking of potential gifts, this weekend will also be a great opportunity to pick up a Market T-shirt or shopping bag. The T-shirts are available in a variety of adult and kid sizes and are $10 ($8 for kids). The bags are roomy, sturdy, and made from recycled cotton - $15! Both items are great gifts. The staff at the City tent at the NW entrance to the Market will be happy to sell you either one (both?) of these. Community groups, CraveTruck and Candide Roasteries will be in Row 4, ready to provide info, engagement, waffles, and strong coffee. 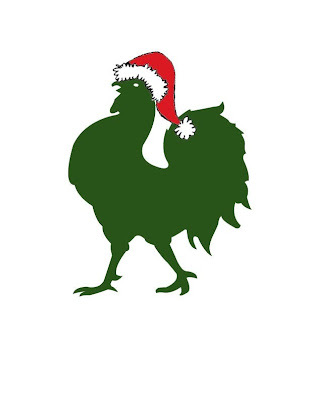 Thank you so, so much for your patronage at the Market this season. Staff, vendors, community organizations, and musicians appreciate your support of their food, their work, and of the local economy. 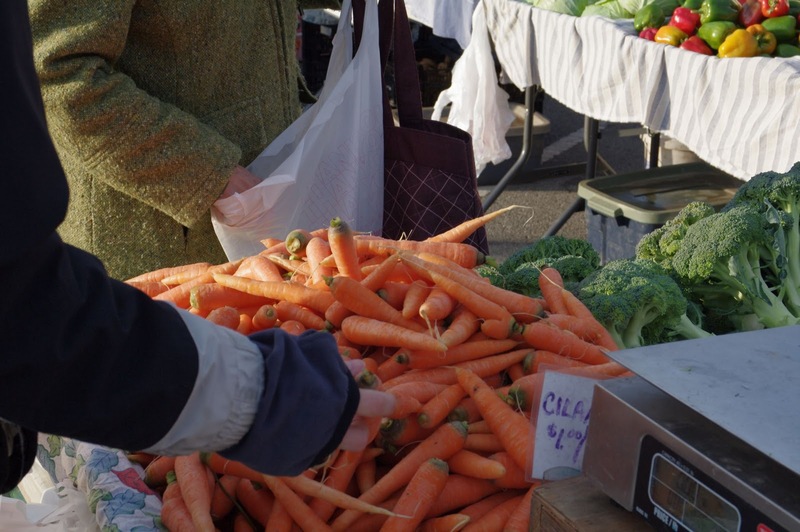 We're already looking forward to next season - we hope to have a new strategic plan in place and will be working hard to bring an even better Market to the community in 2012. Also, we'll be updating this blog periodically during the off-season with Market-related news and other items of potential interest to readers - please don't remove us from your feed readers or bookmarks! And remember - we invite feedback in comments, or you can always drop us a line via email. In the meantime - swing by and say farewell to us. It'll be worth your time. The Market is smaller in size, but not in spirit on its last day. The Market runs through November 5. For more information about the Urbana Business Association's Holiday Market, please click here. 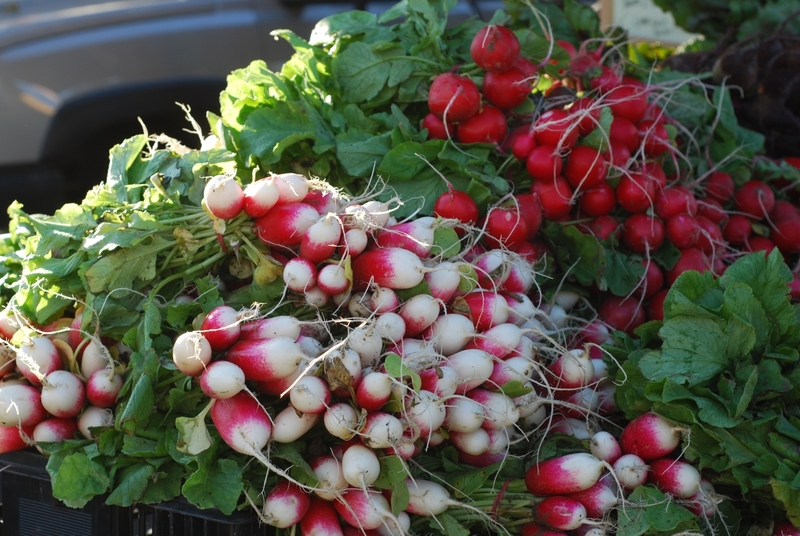 Funny how some folks think farmers market season should be over by now. After all, it's late October! There's not much left in home gardens! 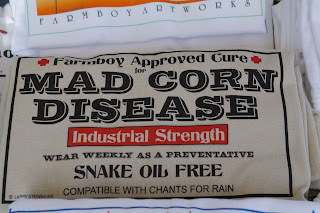 No peaches, no sweet corn - no food, right?! 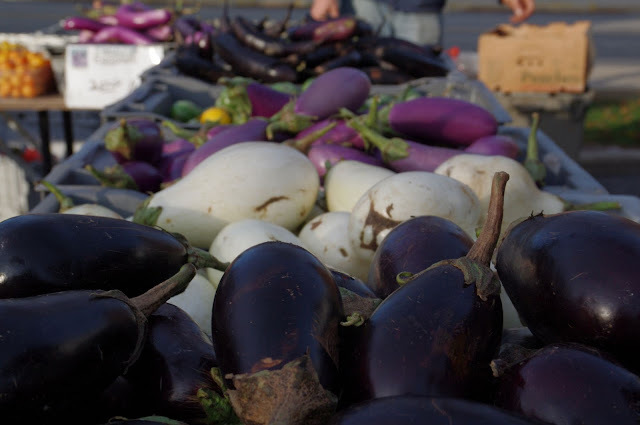 There's no shortage of food at the Market late in the season. If anything, there's more food available to all you eaters, not less. We didn't even get the photos of the fruit - apples and pears have been delightful. Last week's chilly temperatures froze a few things out - the Owens family, whose cut flowers are a highlight of the Market every weekend, won't be back for the rest of the season due to the heavy frost they experienced - but you can expect the Market to look, food-wise, a lot like what you see above. That includes the sun, thank goodness. ... the Market will likely be consolidated into a total of 4 rows, including community organizations, this weekend. Yes - community organizations are still around - in fact the folks from Staerkel Planetarium will be there with two telescopes (one for safely viewing the sun! ), the C-U Folk & Roots Festival will be there, CIMIC will be there, U of I UNICEF, and several others. Look for them on the east side of the Market, in the same row as Crave Truck (pumpkin waffles through 11/5!) and Candide Roasteries. By the way - don't forget the Market merch! We still have t-shirts left - men's and women's are $10 apiece, and kids' shirts are $8 - and just a few totebags remain (see photo in last week's blog entry) - they're 100% recycled cotton, are extremely roomy & durable, and are just $15. Come find 'em at the City tent. The Market's draft strategic plan was presented to Urbana City Council's Committee of the Whole this past Monday night, and it looks good for passing the Council on 11/7. Thanks very much to everyone who provided input about the Market - it will help us do the best possible job with the Market in the short- and long-term future. You can watch the presentation here. Thanks so much for all your support this season. Please come visit us these last two weeks! Our last day is Saturday, November 5, from 7 AM - noon. The Urbana Business Association's Holiday Market gets underway at Lincoln Square on Saturday, November 12, and runs through Saturday, December 17. More info here. 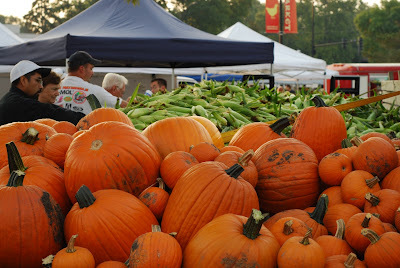 The end of the outdoor Market season is peeking at us. The weather this week has been blustery and wet and downright cold after such a hot summer and a few mini-blasts of warmer weather these past few weeks. It feels good to report we're getting a reprieve for Saturday's Market. It'll be cool, especially in the morning, but the wind will die down and the skies will be sunny and things will be dry. Oh, and there'll be food. Lots and lots of food. Last weekend was terrific - very busy, lots of patrons. We're hoping for the same this weekend, because the real revelation right now, food-wise, is the cooler-weather produce. Last weekend we saw beautiful heirloom tomatoes (ripened during that last warm spell) Misato and Daikon radishes, broccoli, cauliflower, an amazing array of squash, potatoes, onions, kales... it was incredibly colorful, especially when you added the peppers, leeks, apples, beets, and cabbages. 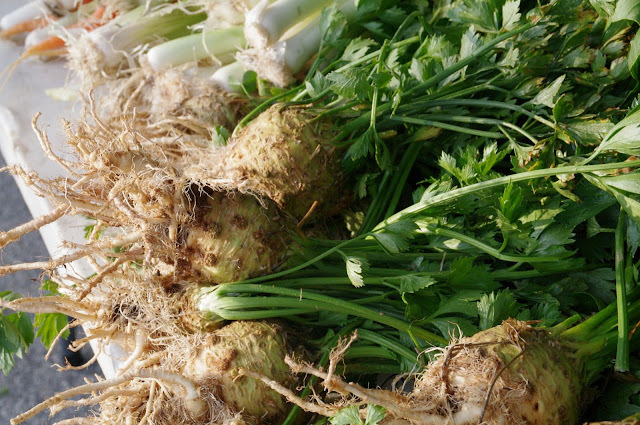 This week you can add carrots to the mix, and you might even run across some Brussels sprouts and a few other surprises. There's nothing like loading up your Market shopping bag* with gorgeous, fresh, local produce and doing something warm and bakey or soupy or stewy with it later. It really is the season to fire up that oven. The Market has grown smaller in response to the cold - we lose vendors to weather - so if you're looking for someone, they may actually be at the Market, just in another location. Check with the staff at the City tent - they can help you out. Part of this consolidation has been the relocation of the community groups to the east side of the Market. Their ranks have thinned as well, but this weekend you'll see CIMIC, CU Folk & Roots Festival, the Urbana Business Association, and several others. 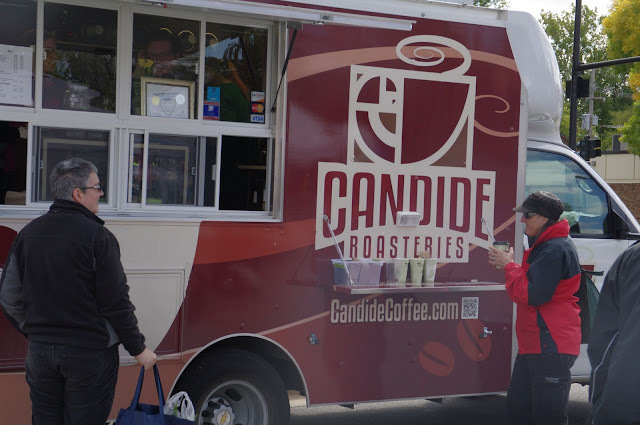 Also in Row 5 - Candide Roasteries and the Crave Truck, both of which will warm you right up. Fall - it's here. Last week's warmth notwithstanding (and we still haven't had our first frost), the angle of the sun and the amount of daylight don't lie. Neither do the fall colors, both in foliage and in food. 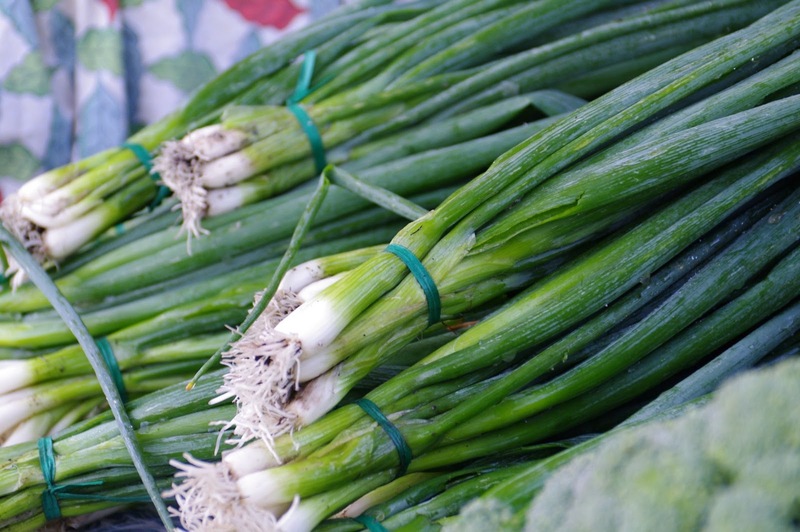 You'll probably notice that the Market is shrinking in size - that's normal for us this time of year, as we lose vendors to the season and the finicky weather. Even with fewer vendors, quality remains very high - there's good eating out there this weekend - see above. Our special guest this weekend is U-Cycle - they're the City of Urbana's curbside recycling program, and this year they're celebrating their 25th year of service. Swing by the NW entrance of the Market to wish them well or to ask questions - even if you don't live in Urbana, they can answer recycling questions. Not only that, the Landscape Recycling Center is available to all county residesnts - they may be visiting at the Market as well this weekend. Community organizations are now in Row 5, cozied up to our very popular prepared food vendors. This week you can visit with the U of I 1867 Society, CIMIC, the Champaign County Forest Preserve, the C-U Folk & Roots Festival, and several others. 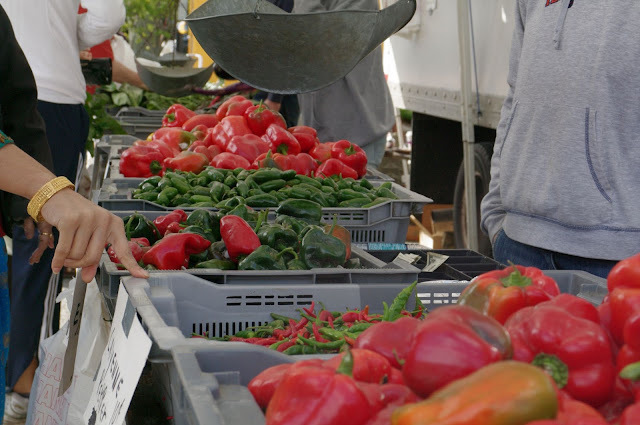 These organizations offer lots of information about their services, volunteer opportunities, and other ways for you to get involved when they visit the Market. We encourage you to pay them a visit! It's always a little bittersweet as we approach the end of the season. As ever, we appreciate your support and enthusiasm and dedication to the Market all season long, but especially as we head down the home stretch. THANK YOU. 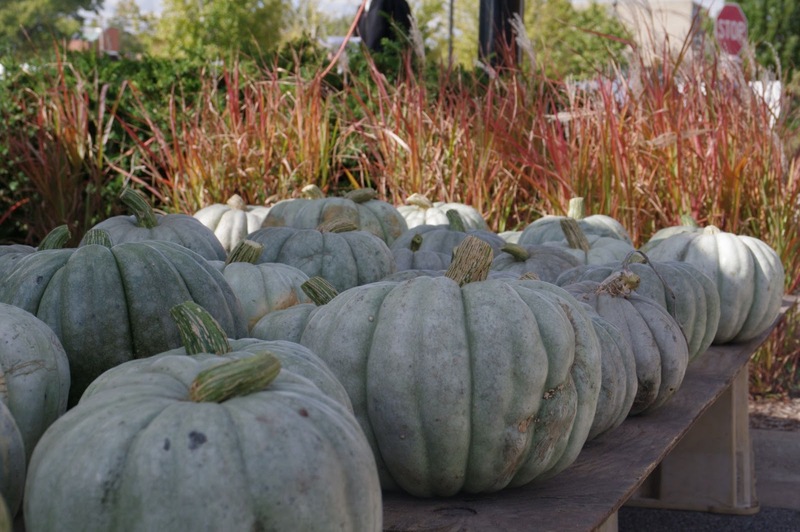 It's hard not to feel good when the weather forecast is so utterly wonderful for the second Market of October. We ask you - what's not to like? It was a lovely day, despite the chill. You'll be seeing fall produce similar to what you're seeing above - potatoes, gourds & pumpkins, peppers, salad and other greens, cabbage, tomatoes (larger ones - the smaller ones are on their way out), some melons, beans (string, edamame, and others), eggplant, tomatillos, radishes, apples and pears, and probably a few surprises. Last week was the final week for Schottman's sweet corn, and while we could still see some corn from Kleiss Produce, as of this writing we're just not sure. You'll have to come see. When you do visit, you'll notice a few changes at the Market. This time of year, we tend to lose vendors due to iffy weather and lack of produce, so we consolidate the Market to avoid big gaps in space. This weekend, our community organizations will be located in Row 5 (that's the row closest to Vine Street) along with Candide Roasteries and the CraveTruck, and will be located there through the end of the season. Vendors you may have visited in Row 5 will be in other locations within the Market - please ask the staff at the City tent if you're having trouble locating someone! 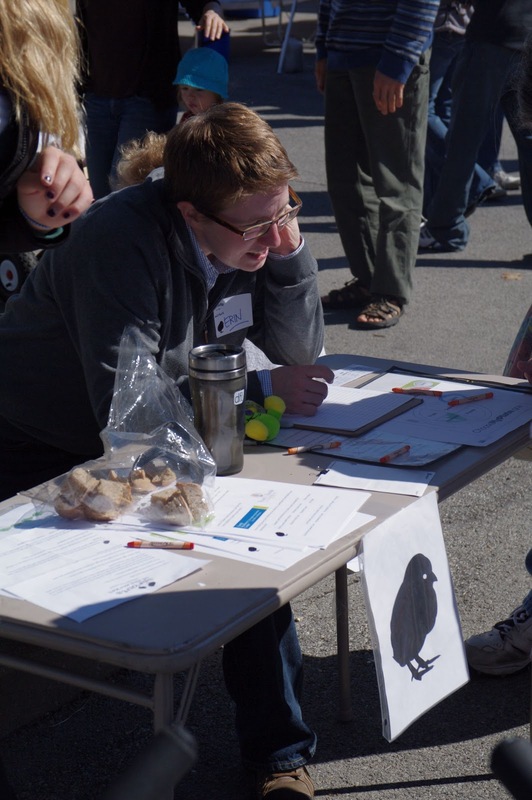 Community organizations in attendance this weekend include Champaign County Democrats, the U of I Physics van, NAMI, Campus Middle School For Girls, Sierra Club, and others. Remember - Row 5! 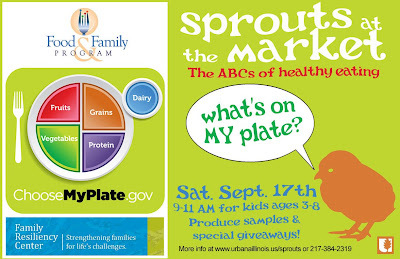 This weekend features our final Sprouts at the Market event of the season. We usually work with the Eastern Illinois Foodbank on this event every October, and this season is no exception. 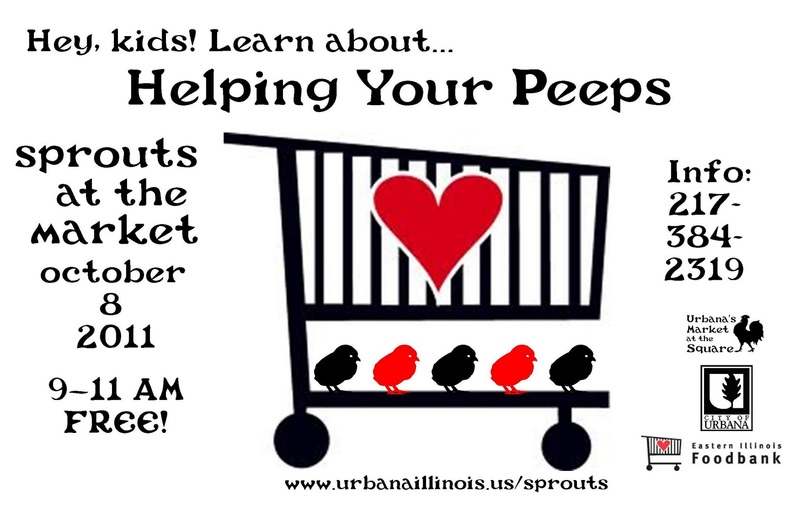 Our event this year is called "Helping Your Peeps" and is all about teaching kids how the Foodbank works and who it serves. There'll be activities, a story about Dan the Can, and giveaways, including a Sprouts at the Market tote bag, while supplies last. The event goes from 9-11 AM. Next weekend - U-Cycle in the house! We hope you add the Market to your must-do list this weekend - it promises to be lovely and lots of fun! It's pumpkin time. Warty or smooth, these orange beacons of a new season are at the Market and are ready for carving, adorning your front porch or table, or... eating! Yep, eating. Everywhere you look there's pumpkin-flavored coffee, pumpkin muffins, pumpkin cookies, pumpkin etc. 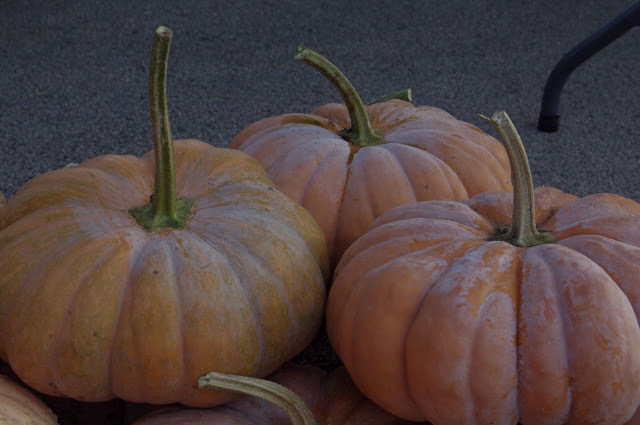 Why not make some pumpkin soup, or a pie, or some scones on your own with the little pie pumpkins (also known as sugar pumpkins) some of our growers are offering up? It's easy to make your own puree. 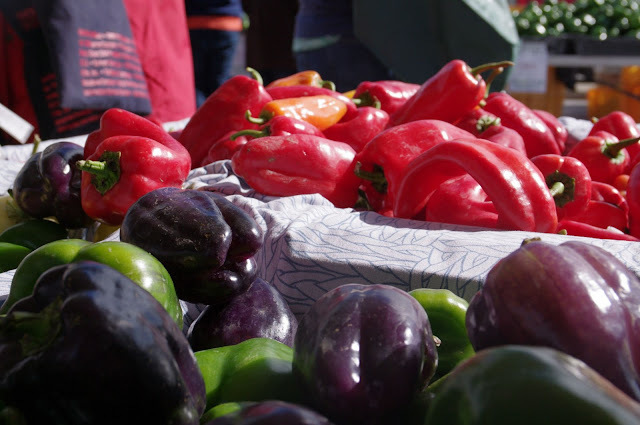 This weekend's Market will be cool and sunny and just about perfect. If you're coming to town for the U of I Homecoming game vs Northwestern, welcome! 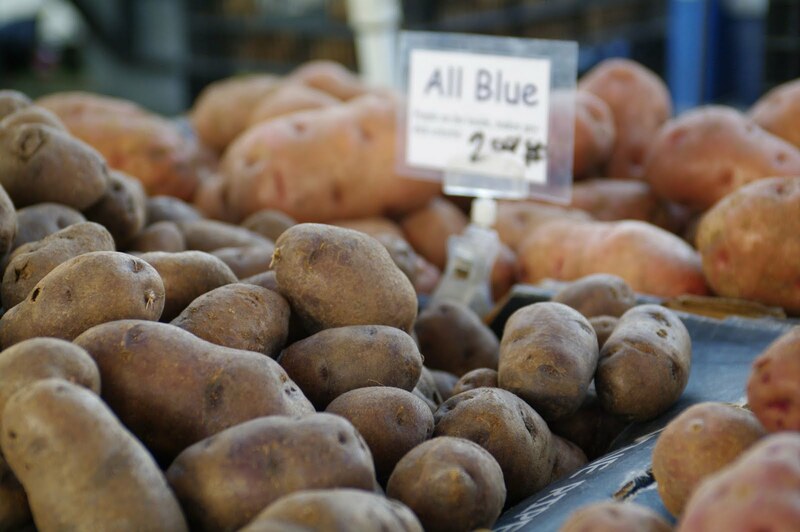 Then get on over to the Market early to grab some breakfast and pick up some produce. 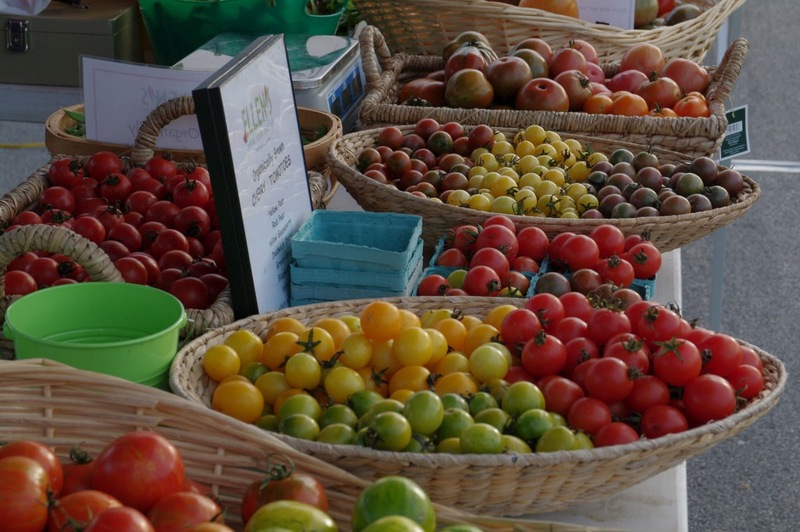 We'll have plenty - we're looking at lots of peppers, beans, other fall squash, broccoli, cabbages, onions, potatoes, salad greens, chards & kales, and a few straggling tomatoes (it's been a tough tomato year). 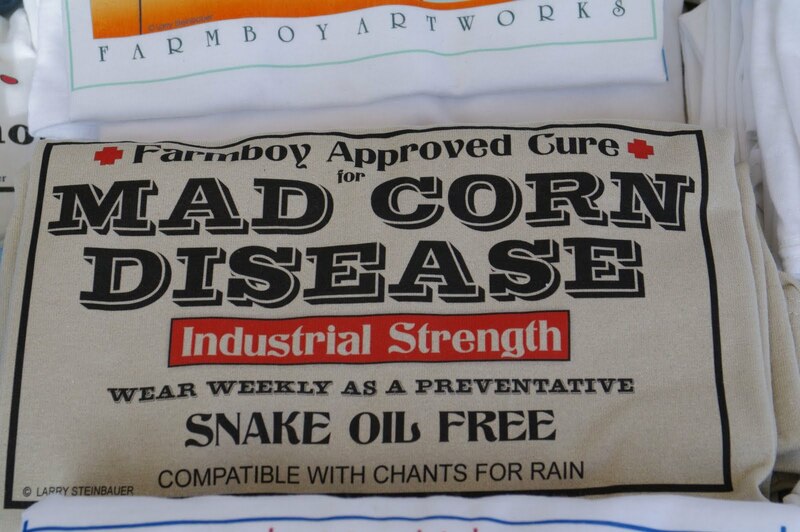 A bit of sweet corn and the probable end of the melons will be available this weekend, too. 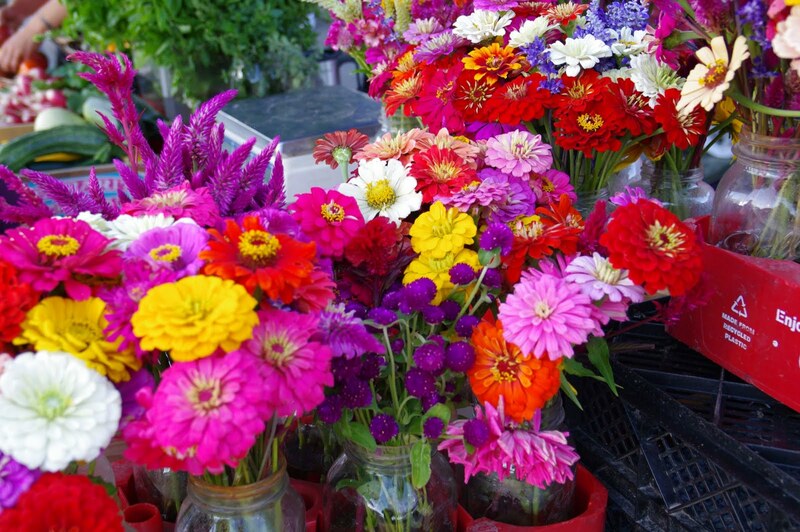 Growers will be offering seasonal cut flowers in bouquets and other arrangements, as well as potted mums and asters to plant into your yard. 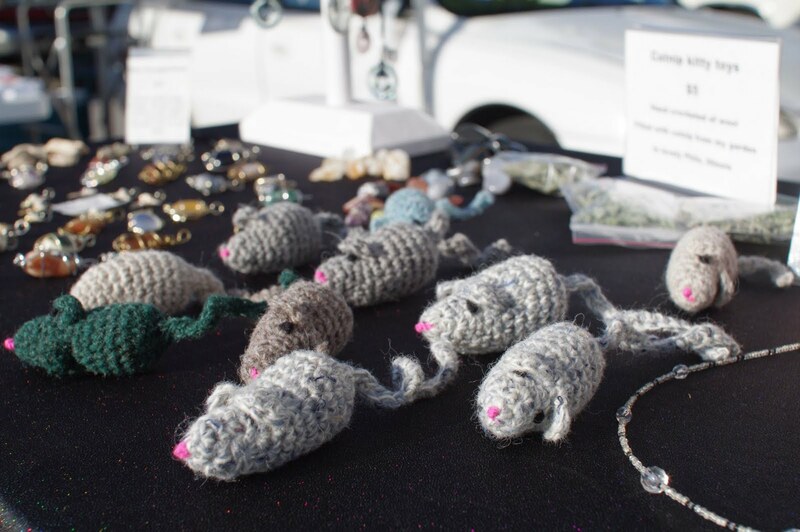 And, of course, our artisans will be offering up quite the array of beautiful, handmade things - many seasonal in nature. 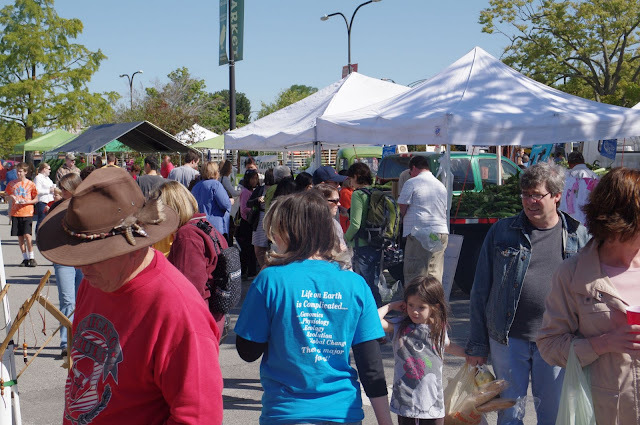 Community organizations at the Market this weekend - Urbana Business Association, Sister Cities Project, Infant Cognition Lab, Champaign County Health Care Consumers, CIMIC, St. Patrick's, TIMES Center, and others. Come check out these organizations - they're in our community to help, but at the Market they also have information on how YOU can help, whether it's as a volunteer or a donor. The groups are currently located on the west end of the Market, between the Market's two main entrances. This weekend, look also for the Urbana Free Library near the City tent at the NW entrance - they'll be there for the final time this season, filling helium balloons and reading stories to kids and answering questions about the library from 8 AM - 11 AM. Many thanks to everyone who participated in last weekend's Art at the Market workshop. Many, many patrons came by and made "Shrinky-Dink" -style crafts with local artist Lori Caterini. 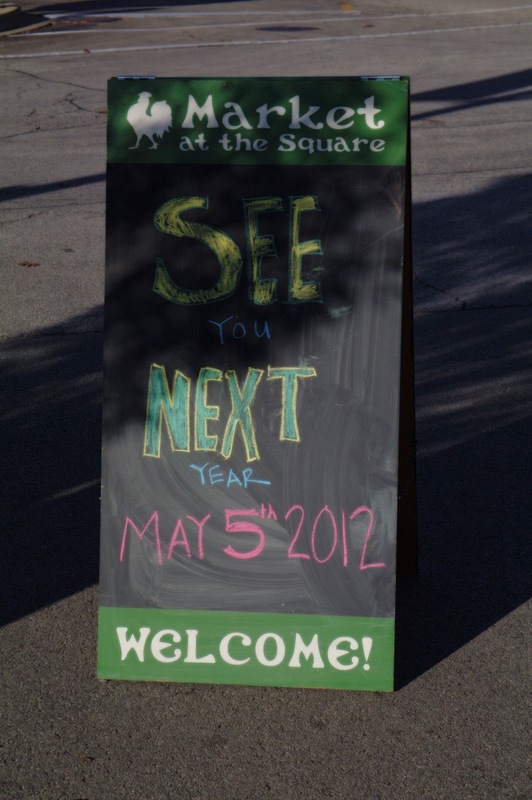 The final Art at the Market workshop of the season will be on Saturday, October 29. More details when we get them! 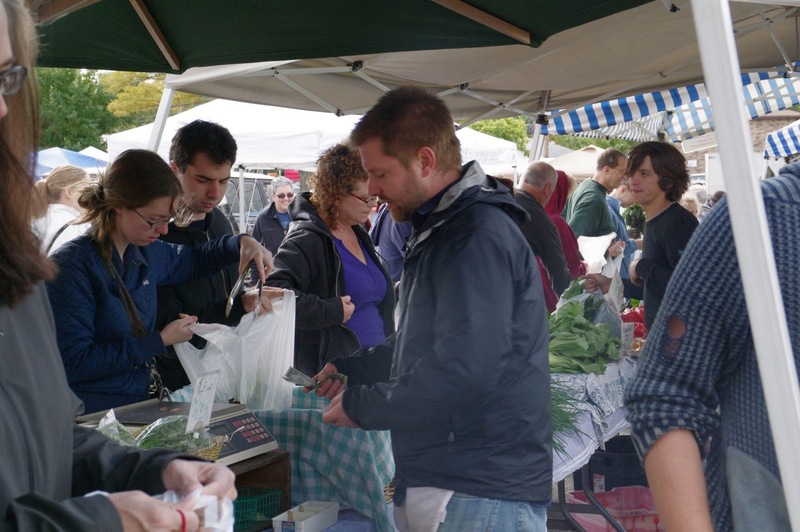 Looking forward to seeing all your faces at the Market this weekend! Last week's Market fell on an early autumn-perfect Saturday. It was chilly in the morning and quite warm by noon and a lot of people came, as you can see. They bought food, they bought flowers, they bought arts & crafts, they visited with their friends, they participated in the Sprouts workshop, they hung out with the community organizations, and they generally enjoyed themselves. 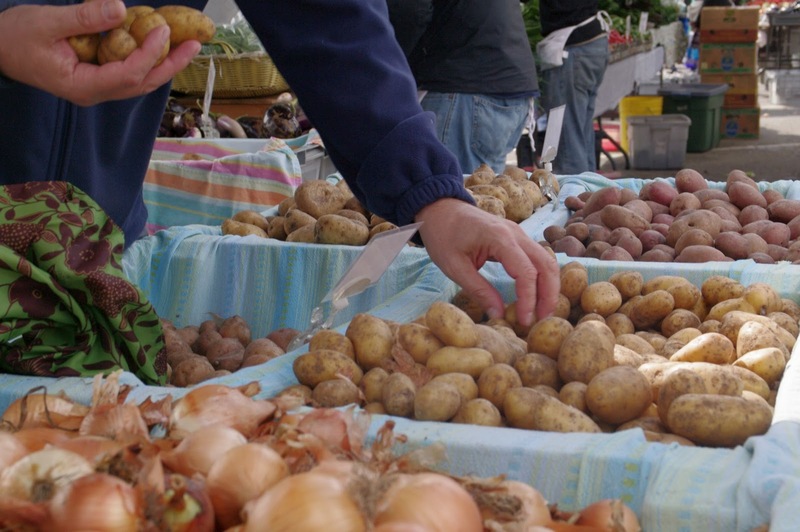 It's what people do at the Market every weekend during the season, and we're glad they do. The season is winding down, a little. Summer produce is on its way out; much of it is done already (peaches coming to mind, here). That's OK. It makes way for fall produce - the squashes and root vegetables that bring so much color to Market tables... and our tables. 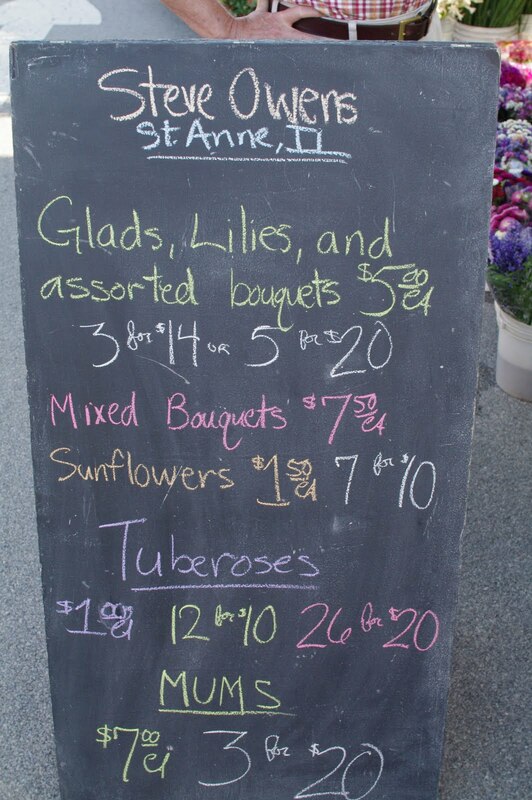 The flowers now offered are hardier and able to stand up to cooler temperatures. There are pumpkins alongside the melons. 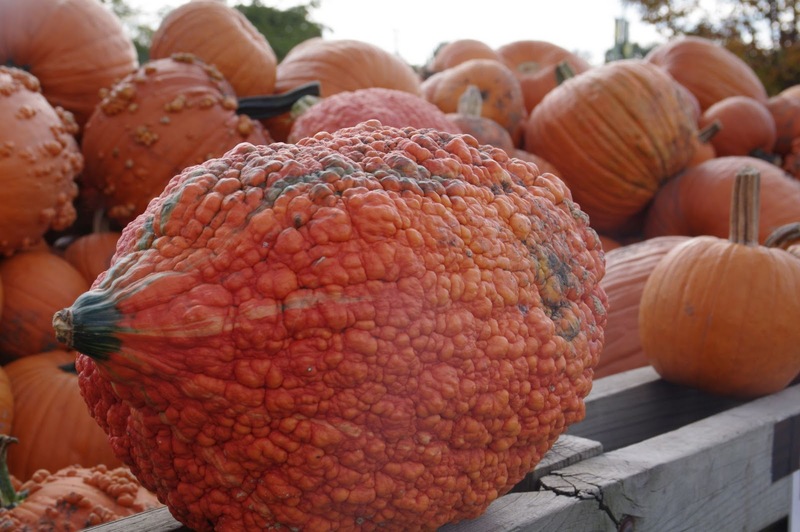 It really is a terrific time of year at the Market. We talked about local produce and its benefits with ciLiving yesterday. ciLiving is a new show on WCIA that's on from 4-5 PM with all local content. Click here for the video. It was great - the feature before our segment was all about Market vendor Prairie Fruits Farm, and the segment after ours featured Market vendor The Cravetruck. Community groups this weekend: Look for the Eastern Illinois Foodbank, AWARE, Illinois Club, Champaign County Democrats, U of I Physics (with cool stuff! ), Habitat for Humanity, Illinois Doberman Rescue Plus, ASPCA, and others will be in the community organizations area on the western side of the Market, right between our two main entrances. Please go give them your support. Special activity this week: Art at the Market, the Urbana Public Arts Program's free, monthly hands-on workshops for people of all ages, will be happening this weekend with local artist Lori Caterini teaching everyone how to make "Eco Shrinky Dinks" from #6 plastic. If you have a stash of #6 plastic lying around (U-Cycle can't accept it for recycling, so you just might! ), bring it with you! The workshop is continuous and goes from 8 AM - noon. Hope to see you there this weekend - rain or shine. 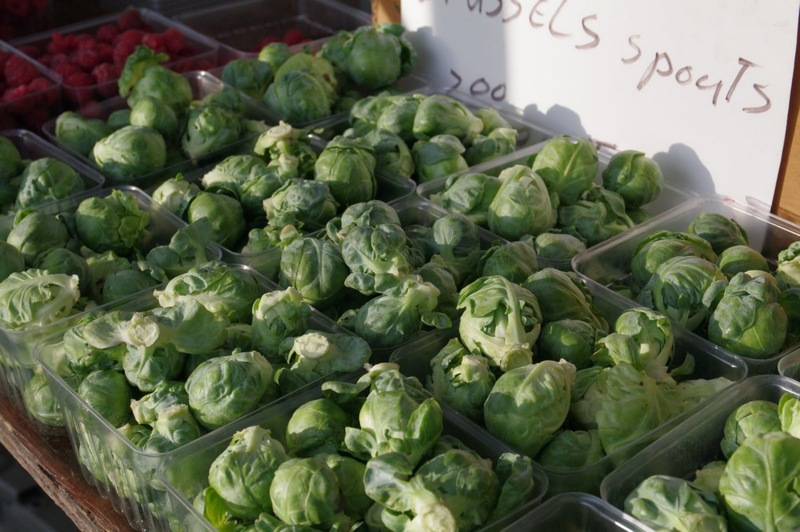 It's Sprouts time again at the Market! This month we're working with the Family Resiliency Center to bring not just nutrition information, and not just information about farms and farmers, but information about healthy family mealtimes, too. The event goes from 9-11 AM this Saturday and is FREE. Not only that, all kids who finish the Market-wide workshop will receive a special (and extremely cute) prize AND an official certificate of participation.... which is good for 25% off at Art Mart Toys all day Saturday. Come find us at the Sprouts tent - it'll be at the NW entrance to the Market. Questions? Just call 217-384-2319 or drop us a line. 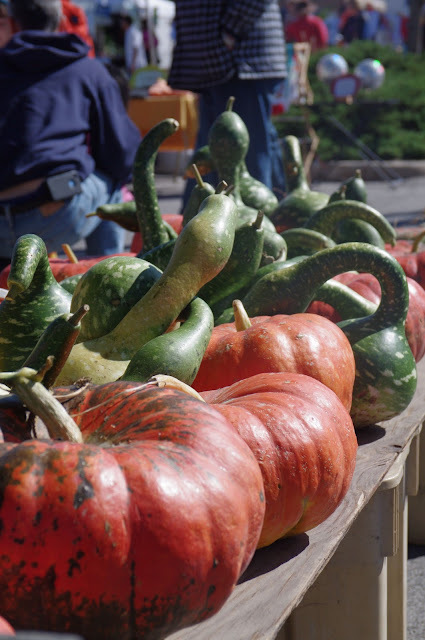 With the cooler temperatures, we're starting to get excited about eating soup and stew... must have been the pumpkins, squashes, and potatoes we saw last week. Cooler weather also means that eating outdoors - whether while tailgating for the game this weekend (6 PM start at Memorial Stadium) or while having people over for a backyard cookout - is way more pleasant. These activities are a great chance to take advantage of the Market's selection of late summer and early fall veggies, early fall fruit, and farm-raised meats. There is just something awesome about eating in cooler weather. Especially if it's an apple galette. In addition to Sprouts, the Graduate Students in Ecology and Evolutionary Biology (GEEB) will be at the Market this weekend offering Market-goers a chance to get their hands dirty. If you're feeling particularly brave, you can pet their corn snake or their blue-tongued skink. Look for them in the Community Organizations row at the west end of the Market. 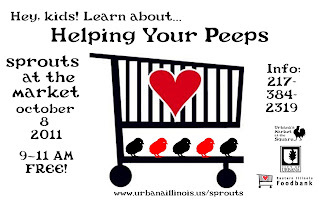 Other groups this week: Eastern Illinois Foodbank, AWARE, Practical Assistance For Survivors, Infant Cognition Lab, Chambana Moms, Champaign County Democrats, Champaign County Forest Preserve, CU Folk & Roots Festival, Champaign County YMCA, and others. A swing through this area will give you a lot of insight about what's going on in our community. Please go check them out! It's looking like a busy Market this weekend... see you out there! 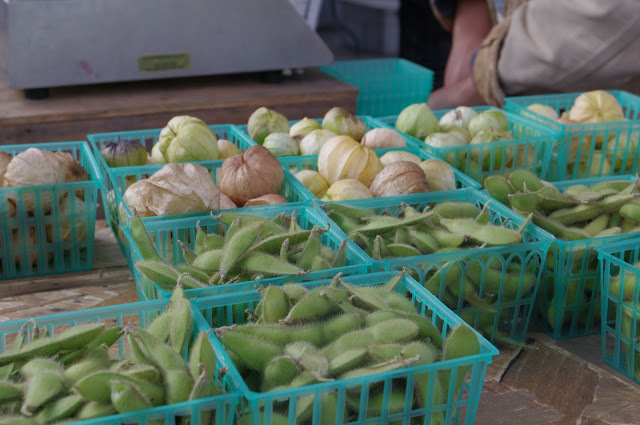 This weekend, in addition to the Market, we'll be co-sponsoring, with Common Ground Food Co-op, an event with Ken Meter, nationally-recognized food systems analyst, over at the Co-op (just to the northwest of the Market site). Mr. Meter will be presenting his findings about the central Illinois food system and how we can make local food more of a priority for the enhancement of sustainability, community health, and economic development in our area. His presentation begins at 10:30 AM and runs until noon, including a Q&A session with the audience. It's totally free and it's open to the public. 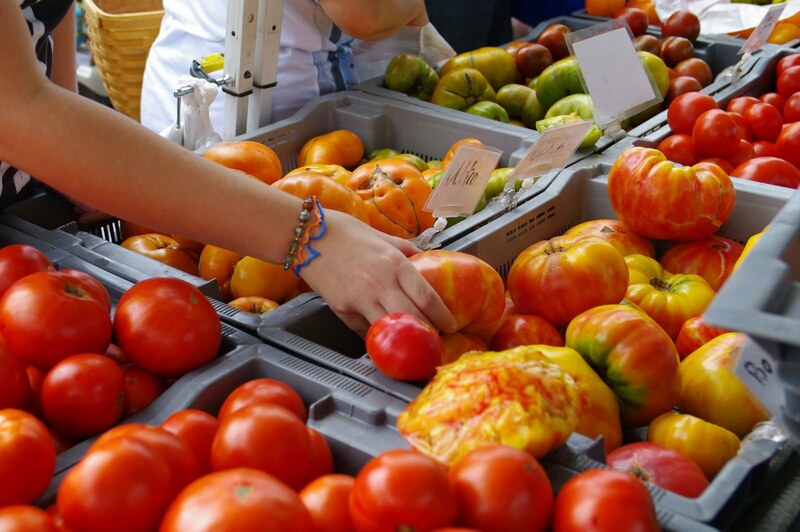 Head over after picking up your Market goodies! Highly recommended if you're interested in seeing more locally-produced food in institutions and in larger grocery stores, if you'd like to see more restaurants carrying menu items made with local food, or if you're interested in encouraging community food security in our area. For more info, call 217-384-2319 or drop us a line. We're in that time between the seasons. Actually, the weather can't decide which season it is (high 90s last weekend, mid-70s this weekend), but the calendar doesn't lie. We're heading into Fall. Where did the summer go? That's OK, though. It's a season full of color and food and, hopefully, cooler weather. If you come to the Market this weekend, you'll find cooler temps and a vast selection of fresh, Illinois-grown food. And while a few things are on the wane (peaches/nectarines and berries, especially), some things (winter squashes, apples/pears) are on the rise. That's seasonality for you. Isn't it great? FACET (Friends Against Children's Empty Tummies) will be having their annual bake sale in our community organizations area THIS WEEKEND. All proceeds go to the Eastern Illinois Foodbank, who will also be in attendance. The baked goods? QUALITY. The cause? MIGHTY. Please visit them - our community organizations area is right smack between the two main entrances to the Market, on the west end. Speaking of community organizations, we'll also be having the Parkland Natural Sciences folks out at the Market conducting all kinds of experiments - fun for kids, fun for adults. A preview of the planned activities can be found here. Other organizations we plan on seeing this weekend: Champaign County Democrats, U of I Vet Med, the Infant Cognition Lab, Illinois Club, CIMIC, Sierra Club, and others. Also - the Community Blood Services of Illinois will have their Bloodmobile out in the parking lot west of the Market site this weekend - see them if you're interested in donating blood. They'll be there from 7:30 - noon. Reminder - Urbana's Market at the Square takes credit/debit cards, and we accept the LINK card as well - now with a double value program that can help LINK users stretch their resources. For more info about Double Value for LINK, click here. 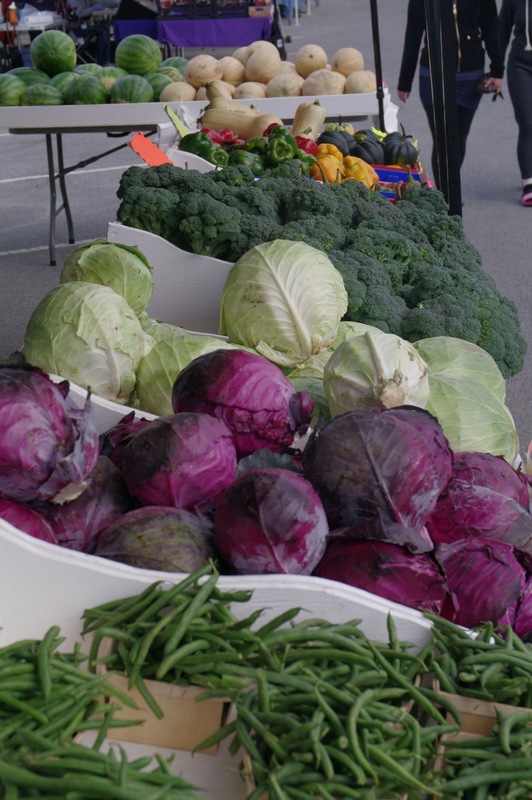 As you can see, there's plenty to do and see at the Market this Saturday. We hope to see you there! 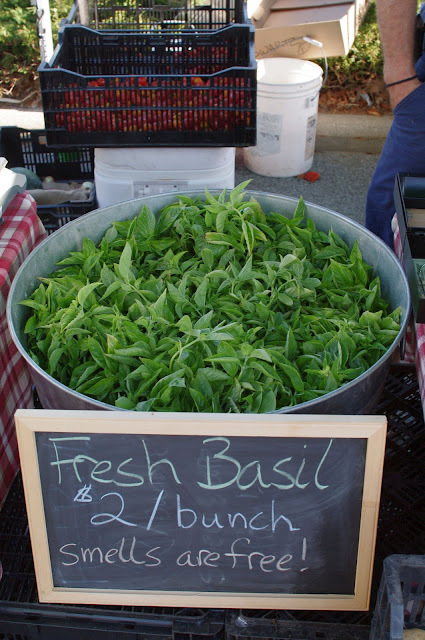 ... and make pesto for our Labor Day festivities. You can also still pick up peaches from southern IL (definitely on the wane, so now's the time to stock up if you do any preservation) and sweet corn for the grill. Other fruits and veg you'll see at the Market this weekend besides those mentioned above: tomatoes of all kinds, melons of all kinds, beans, okra, greens, peppers, eggplant, cucucmbers, summer squash & zucchini, onions, potatoes, carrots, fresh herbs, nectarines (probably the last weekend for these), assorted berries (probably the last weekend for these, too), and some early apples/pears and fall squashes. This is in addition to the frozen, farm-raised meats, farmstead goat cheese and goat's milk gelato, farm-raised eggs, honey, and home-grown/arranged flowers. 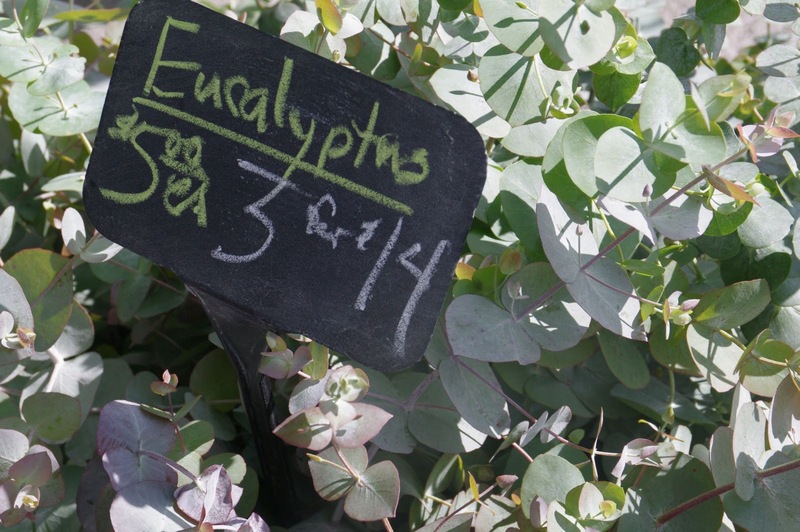 And while it's hard to think about fall plantings and flowers, chrysanthemum season is upon us, and several of our plant and flower folks will have them ready for you to take home. As always, there'll be a wide variety of baked goods and prepared foods, iced/hot coffee and tea and other beverages, and the work of area artisans to check out. This weekend woodworkers, photographers, candle and soapmakers, upcycled apparel creators, painters, glassblowers, knitters & crocheters, and others will be showing their work at the Market. Danville Gardens: Back in their usual Row 3 digs this week. 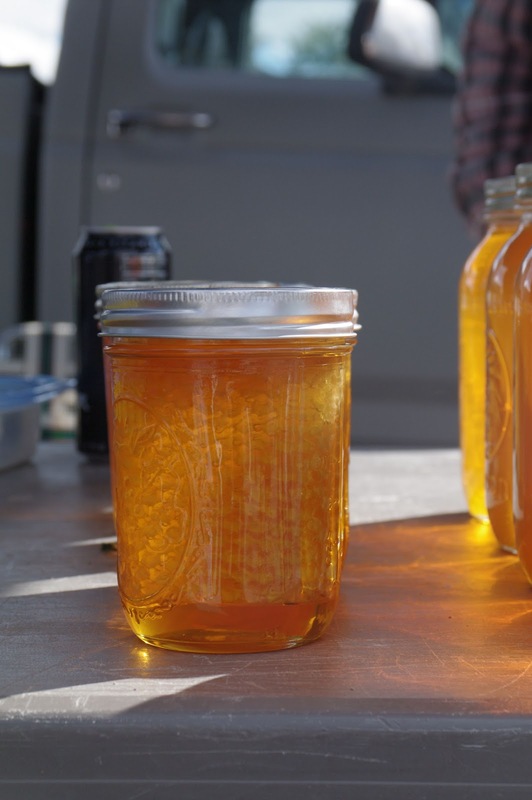 Blue Ribbon Apiaries: Back for 2 dates in September - this weekend and 9/17. Veggie Trails: on (possibly permanent) hiatus. Sager Farms, aka "The Peach Lady From Southern IL": Done for the season. Eberlin's Orchard: Done for the season. Red Herring: Done for the season - too busy making food on campus! Is there someone you've been wondering about? Drop us a line and we can try to help you out. Community organizations often take a break over Labor Day weekend, but we have some great groups coming this weekend - among them the U of I Nanotech folks, who will be doing some demos at the Market this weekend. For a preview for what they'll be up to, check out this video. Other visitors include Vet Med, Illinois Club, Champaign County HOUSE, Jobs For Justice, Champaign County Democrats, and several more. Organizations are now located on the west end of the Market, between the two entrances, and are a great resource for information and volunteer opportunities. Details about our event with Ken Meter will be available ASAP - in the meantime, mark your calendar for September 10, 10:30 AM - noon, at Common Ground Food Co-op. 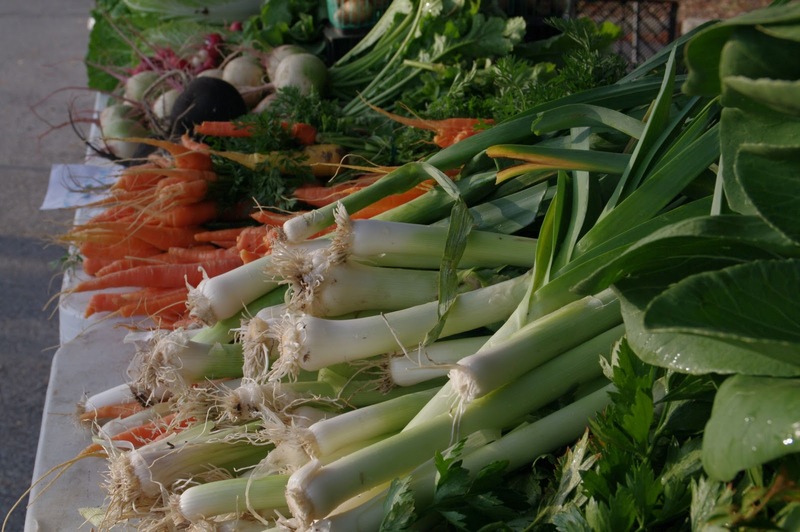 Ken will be delivering a presentation about central IL's existing food system and things we can do to make our local food economy much more robust. He'll also be taking questions from the audience. This is an important issue that affects all of us - it would be great to see you there.